We bought two of these chairs. They are well made and sturdy. The fabric is really pretty. Love the look and accent chairs brought the room to life! Bring some color to your home with this Cassidy modern accent chair. 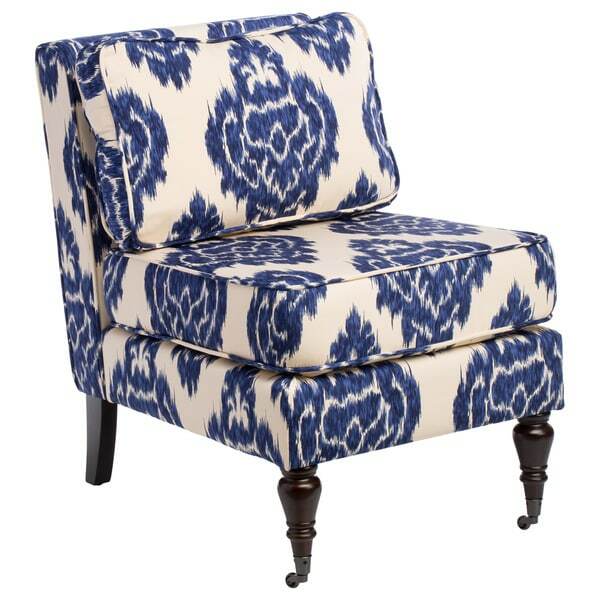 The extra thick foam padding is a luxurious treat to sit on and the indigo ikat print is cheerful and vibrant. Casters on the front legs and reversible cushions make this armless accent chair practical as well as lovely. The thick foam padding on this chair creates a comfortable seating option for any room in your home. The back cushion is reversible, so you can easily flip it when needed. Small rolling casters are built into the front legs of the chair, so you can easily move it around the room. I like it but it isn't the highest quality piece- I knew for this price I wasn't going to get a high-end, high-quality piece but with ikat print I didn't want to invest a lot and get sick of it in a couple of years. As others have mentioned, the pattern was slightly crooked on mine but not bad, I am sure I am the only one who will notice it. 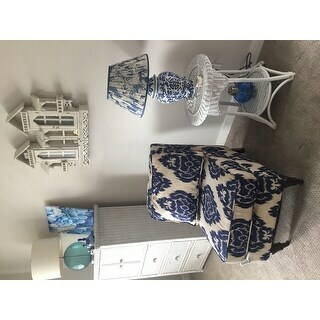 You can even tell in the photos that the pattern on the side of the bottom cushion doesn't match up with the pattern on the side f the bottom base- if they had taken the time to do those sorts of things, I would be really happy. The fabric is a nice thickness and feels like it will stand up for awhile. One of the front legs (the back legs are fixed, but you must screw in the front legs) is crooked when screwed in- as if the hole was drilled crooked. Again, it is pretty slight and doesn't do anything to the 'level' at which the chair sits on the floor; it isn't unsteady, etc. The chair is quite deep so those with short legs will have trouble touching the floor if scooted all the way back into it. I think it is a pleasant compromise between firm and soft- very comfortable to sit in for a couple of hours which is a surprise given it is meant mostly to be used for only occasional use. The colors are very pretty and I like the turned legs on the front. My two chairs arrived well packaged in easy to open cardboard containers and were easy to unload. I assembled them in a just a few minutes. The blue is really beautiful and is a true ink blue with a shadow of lighter blue giving it the ikat effect. The cream is just that, cream. It is lighter than beige and certainly not a white. The fabric has a polished finish giving it an upscale look. 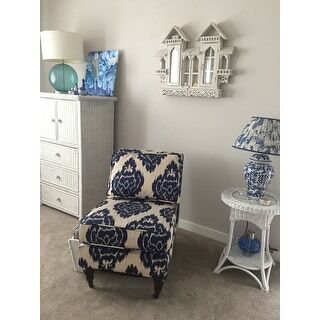 The patterns match on both chairs and are well placed on the piece. These chairs are not the chair you want to sit in to read a book or watch TV. They are very firm and the seat is large. You can't sit back and relax. Great for company sitting around drinking wine and enjoying conversation. Great for a tall person since the seat is deep. They are very pretty and so far, so good. If I run into any problems with them I will let you know. Failed to meet my expectations. This could be a great chair. I love the slipper chair construction and it's just the right size, small enough to fit in a nook or corner of the room. I have admired this chair on the website for a while and finally decided to purchase it. I was disappointed. Overall the chair is well made but I was not happy with the way the pattern didn't line up and was not straight vertically, and it made it look cheap and thrown together by a mass production company that didn't care about the little details. The fabric is actually quite shiny, which I didn't realize, which seems to cheapen it even more. Even though I was not satisfied, I decided to keep the chair rather than paying the $** return shipping because I like the bones of it. Luckily I can upholster furniture. With good upholstery it will be great. I will rethink purchasing this type of furniture online in the future. The Ikat Armless Chair is more beautiful than I hoped for. The fabric is very high end and the workmanship is incredible. Very well made chair with a beautiful designer look. LOVE LOVE LOVE this chair. This chair looks great in my front room - I bought two for a sitting area next to the window. It shipped nicely, was easy to assemble, and is just as pictured on the website. The seat cushion is firm and long so great for average to tall people, and the back cushion is comfy. All in all a great purchase, especially for the price! I bought this for my kitchen/ dining room. mainly I really love the style and color. it is beautiful and looks awesome with my light yellow and navy blue. everyone that comes in always comments how much it really accents the room. the only down fall is its on a tile floor and the front wheels roll, I think I would prefer to have no rolling wheels on front. watch out it slides away easy on tile floors. over all I really love it and it is really complainants the room. wish the cushion could be rotated or flipped over. the back cushion you can flip over . but not bottom one. Great extra seat for the living room. I put a small pillow against it for back comfort. The colors are vibrant and material quality. LOVE these CHAIRS!! They just make the room! The fabric is amazing , very good qualilty! These chairs are a rich indigo blue color with a bold design. They have nice details down to the metal wheels on the front legs. The fabric has a very nice feel and great color! The chairs (2) arrived today. They are lovely in my den. Here's a few comments. Attaching the back to the seat was a bit problematic because the screws that attach the parts weren't fully functioning. One one chair there was no threads on one of the three places. The other was a bit challenging also. The seat front to back is longer than I expected. My daughter, 5'3" can't put her feet on the floor. It was fine for me. The loose pillow on the back works nicely. The seat is a little stiff but not bad. Overall I think they're a good buy and fit the room nicely. The color is more of a cream and blue vs white and blue. Pattern does not line up correctly. Fabric Ok and style is very good. The fabric is a shiny polyester. It is obviously cheap. The chair is very narrow and with the stacked cushions it just looks and feels uncomfortable to sit on. Also, with two chair side-by-side the patterns don't match. We had to buy washers and other hardware to make the chairs level to tile floors. Probably would have worked better on carpet.Liked the color and the style. Wondering if these might be seconds. Great chairs! Actual match pictures just fine. I choose them for the color, and they match perfectly. This is a lovely chair. The fabric is an excellent quality and exactly like the photo. It is not a large chair so be sure to measure your space. I bought 2 of these and love how they look as a pair. Small in size but they look good for the space I put them in. Arrived quickly and well packaged. great colors, great quality easy to put together. I got the ottoman to match that its cover comes off and I store photos albums in it and a blanket. Firm but very comfy! Great side chair, comfy and easy to assemble. The material is vivid with a dark satiny feel it takes you to the markets of far away places. The chair fits perfectly into a bedroom or living room. It provides stylish comfort with its deep cushions and back pillow. I have had this chair for several years starting when I bought the matching material to hang on my wall on both sides of my bed. I consider it a little treasure. Beautiful slipper chair. Easy to assemble and just what we expected. Make a great addition to our bedroom. These are lovely chairs and very versatile. If you have two they can be placed together and look like a loveseat or they look great separately. Nice fabric, too. "I bought this chair but want to change the legs because they do not feel secure for heavy people to sit,however the standard legs sold at home depot, lowe's etc. do not fit. Would you know the manufacturer where I may contact and maybe get new legs? thank you "
Hello coopersmewmaw. For assistance with this issue please contact Customer Care at the number below. I hope this helps, thank you for shopping with us! U.S. and Canada Toll free: 1-800-The-BIG-O (843-2446). style, size, color and the positive reviews. and...of course, the price. "what is the size of the box this is shipped in?" Thank you for your question, mp. The size of the box, the Cassidy Indigo Ikat Armless Chair is shipped in is, 20 inches h x 25 inches w x 35 inches l. Have a great day. It is a huge box, I dont remember the size but both my hubby and I didnt know what was in it until we opened the box. "What is the weight limit for those using this chair?" Hello wunderfog, I'm sorry Overstock.com does not weight test items. Have a great day! "Can the seat cushion be turned over for even wear?" Hi vajra1, the seat cushion is attached and the back cushion is reversible. Thanks for shopping with us. This chair is beautiful to look at and is made very well. However, it is impossible to sit on. My husband came home tonight and almost died when he tried to sit on it. It is so high and so hard and the seat is so deep at his feet didn't touch the floor. I'm sorry to report that because the chair is beautiful. "Does this come in yellow, the same way the loveseat was available in blue and yellow?" Hi iloveit142, unfortunately we do not offer a yellow love seat matching these at the moment. We apologize for the inconvenience. "Are the casters on the front legs removable at all, if I didn't want this chair to be "on wheels" but rather stay stationary??" The chair I ordered is on hardwood but doesn't slide.